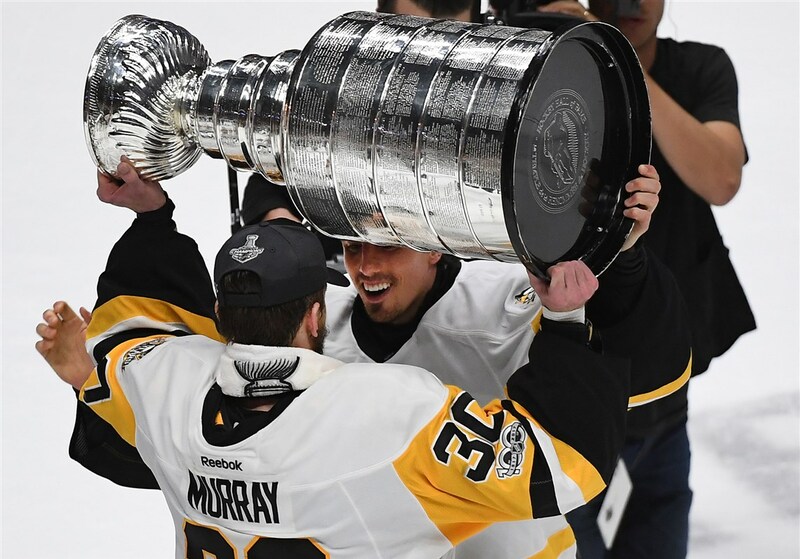 Last night Marc-Andre Fleury took his lap with the Cup then handed it off to Matt Murray. It was symbolic at the time and now it would appear to be foretelling. Reports coming out of the Twitterverse, namely Renaud Lavoie of TVA Sport in Montreal, say Fleury has agreed to waive his limited no-trade clause to Las Vegas. This means that he's still protected from around 18 other teams but the Golden Knights are now free to claim him in the up and coming expansion draft. Every player with a no-move clause can be asked by his team to waive his clause for the expansion draft. So Marc-André Fleury agreed. This benefits the Penguins. They would now have several million dollars in extra cap space, they would not have to worry about which defenseman or young forward to leave exposed, and Fleury gets to go out a hero in Pittsburgh. Also a possibility: A trade that takes the Penguins off of the expansion draft table while getting Pittsburgh a return of some sort. It'll be a sad day when we see Marc-Andre Fleury in a different uniform other than that of the Pittsburgh Penguins. His club since being taken 1st overall in the 2003 NHL Entry Draft, it'll no doubt be an adjustment for Fleury as well. With three Cups in Pittsburgh, as well as franchise records for wins and shut outs his time was not wasted. Where ever Fleury moves next he'll likely be loved and adored as he was in Pittsburgh. From a historical standpoint, he's 125 wins away from 500. If he can post 30 wins per season for the next four years he'll have over 500 wins and a strong case for the Hall of Fame. Stay tuned to Pens Initiative for more on the Penguins off season and back-to-back championship celebration. Shame on Pens organization...I love the pens team and will Always root for them, but marc deserves better than they are giving him...they would not have been in last night's position without him.... Too bad neither Rutherford nor Sullivan can see or admit to that.. So you're willing to lose a 2-time Stanley Cup winning goaltender with a better save percentage and GAA who is over 9 years younger, makes less money, and is coming into the prime of his career- over some hurt feelings? Management has to do what is best for the team, and as much as EVERYONE loves MAF, myself included, his time here is up. Wish him the best, buy his jersey, but don't think the team is slighting him. It's business, and I'm actually proud of how the Pens have handled this potentially awkward situation....Rutherford and Sullivan included.